They may not have the traditional fixings for a Thanksgivingdinner, but the seven astronauts returning to Earth onboard space shuttleAtlantis are set to show their thanks with a memento-stuffed locker forthose who made their mission a success. The STS-129 crew hit the road for the holidayWednesday, departing from the International Space Station (ISS) after six daysdelivering spare parts to extend the outpost's on-orbit lifespan. Theywill spend today and Thanksgiving day circling the planet as they prepare theirship for a return to Earth on Friday, weather permitting. This isn't the first shuttle crew to spend Thanksgiving inspace: Seven prior missions dating back to 1985 have spent turkey day in orbit,many completewith the turkey. 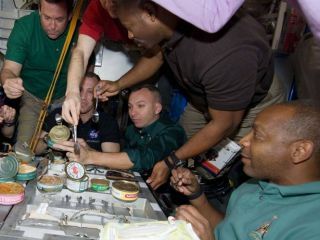 The NASA food lab has, at the commander'srequest, prepared special meals with thermostabilized smoked turkey, freeze-driedcornbread stuffing and spicy green beans, as well as condiment-size packs ofcranberry sauce. Atlantis' commander, Charles "Scorch" Hobaugh,however, decided he and his crew would forego the festive foods for whateverwas on the regular menu. "Whatever is in flight day  'Meal B' that ourwonderful food people packed for us, that's what we're eating. And actually, Iguess it's 'Meal C,'" explained Hobaugh during a news conference heldfrom space on Tuesday. "Thanksgiving isn't all about what you eat, it's thepeople you spend it with. This has become my second family and of course, mymain family is back home," he added. There is a third "family" that Hobaugh and hiscrewmates have included as part of their mission, at least vicariously: theorganizations, educational institutions and community societies thatsupported each of them individually and together as a crew. For them, theastronauts have packed small souvenirs in the mission's OfficialFlight Kit (OFK). "Trying to find things you can pay back organizationsand outfits that either have special meaning to me or just do something specialfor the community or the U.S. people in general can be hard," saidHobaugh in a preflight interview with collectSPACE.com. Every shuttle mission carries the duffle-bag-size OFK, inwhich crew members can carry 20 small items alongside mementos packed byNASA. The package of space-flown souvenirs is not Thanksgiving-specific,but it does share the theme of the holiday: giving thanks. Hobaugh, a Marine Corps colonel, looked to his history inthe military to chose some of the items he flew. In addition to carrying abanner for the U.S. Naval Academy, he also has an item with relevance to afellow student. "My roommate from the Academy of four years, a greatfriend of mine that I hardly get to see but when I do it is like long-lostbrothers, he's the commanding officer of the USS Bonhomme Richard, so I amflying up a ship patch for them," said the shuttle commander. Atlantis' pilot, Barry "Butch" Wilmore wassimilarly inspired to take mementos from his alma mater. Completing both hisundergraduate and Master's degrees from Tennessee Technical University inCookeville, Wilmore made sure the school was well represented in the STS-129OFK. In addition to a gold medallion for the school's College ofEducation and a purple-and-gold placard for the Electrical Engineeringcollege, Wilmore packed a thumb flash drive and a plush eagle mascot forthe university. Wilmore's eagle is joined in the OFK by a stuffed-toy bluespider from University of Richmond alumnus and mission specialist LelandMelvin. Melvin also stowed several pins and the front page of localnewspapers for the Commonwealth of Virginia capital city. An amateur songwriterin his own right, Melvin also flew a family ancestry chart for musicianQuincy Jones, a friend who provided a "wake-up call" song during Melvin's earliershuttle flight. Bobby Satcher, one of this mission's three spacewalkers,also became the first orthopedic surgeon in space. Though he left the tools ofthe trade at home -- "We're not taking any joint replacementequipment," he told collectSPACE.com-- he did represent his profession on Atlantis. In addition to"tweeting" from orbit with the screen name "Astro_Bones,"he said he had a banner from the American Academy of Orthopedic Surgeons,"so they are definitely represented." For fellow spacewalker Randy Bresnik, packing items was afamily affair. His grandfather, Albert Bresnik, had been Amelia Earhart'spersonal photographer and so he flewa scarf that had belonged to the famed aviator, as well as aphotograph taken of her by his grandfather. Bresnik also recognized the next generation of his family,his daughter Abigail Mae who was born during the mission hours after he madehis first spacewalk. The next day, he showed off a pinkonesie decorated with the mission logo, a design he had a hand increating. "If you think about it, you are designing somethingthat is part of a legacy," Bresnik said, referring to the long history ofspace shuttle mission patches. "I think we ended up with a prettyunique patch that people really appreciate for its originality." More than 600 of the STS-129 patches were stowed in theflight kit for later presentation to NASA employees and the contractors whoworked on the mission. Continue readingabout football in space and browse the full STS-129 Official FlightKit manifest at collectSPACE.com.